New York & New Jersey Subway Map shows how we can give people a comprehensive view of transit options in the NYC region. 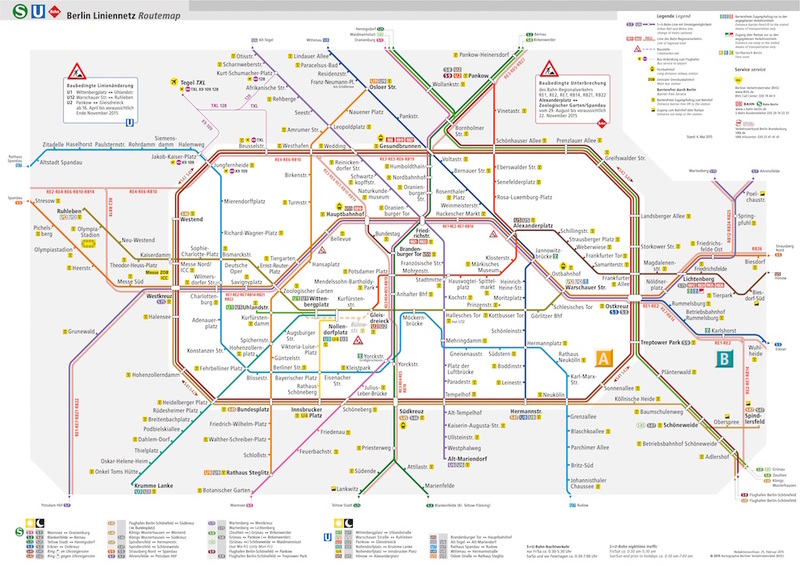 The map generated lively discussion on SubChat, a popular transit discussion board, and commenter AEM-7AC #901 noted that the official rail rapid transit map in Berlin displays services provided by two agencies. Berlin U-Bahn and S-Bahn have different owners, BVG and DB respectively, yet somehow, the concept of leaving the other off the map is seen as silly. The notion that we should only have an “MTA map” with MTA services is rather silly, especially when the bus maps in Queens listed the private bus lines on the NYCTA maps when they operated. I just don’t see the need to pretend that PATH doesn’t exist just because it goes to that place where “dragons may be” and has “train engineers” in lieu of train operators on what are essentially smaller versions of an R-160. As far as I’m concerned, it’s the subway to Hoboken, Jersey City, and Newark. Berliner Verkehrsbetriebe (BVG) is the main public transport agency in Berlin, which manages the U-Bahn subway, as well as bus, ferry, and tram networks. Deutsche Bahn (DB) is the German national railway company, which manages the S-Bahn regional rail service. They appear together on the city’s official transit map, and operate with a unified fare structure and payment system. Through the Verkehrsverbund Berlin-Brandenburg (VBB), a transport association jointly run by the states of Berlin and Brandenburg, the fare and ticketing system encompasses (as of 2005): 10 Berlin U-Bahn lines, 16 Berlin S-Bahn lines, 43 Regional rail lines, 41 Tram lines (26 Berlin, 15 Brandenburg), 949 Omnibus lines (204 Berlin, 745 Brandenburg), 2 Trolleybus lines (Brandenburg), and 7 Ferries (6 Berlin, 1 Brandenburg). The fare area of the Transportation Association Berlin-Brandenburg (VBB) covers the federal states of Berlin and Brandenburg including their rural districts and the cities of Brandenburg a.d.H., Cottbus, Frankfurt (Oder) and Potsdam. Although the VBB fare area is divided into several zones, it provides one structure, a uniform assortment of tickets, the same conditions of transport and fare regulations as well as one information system. This collaboration between agencies serving the same urban core seems to derive from the German concept “Organisation vor Elektronik vor Beton“. Translated, it says “Organization before Electronic before Concrete”: changing the organization should come before more expensive and complex tasks like large infrastructure projects. In the German-speaking world, there’s an old saying about transit planning: Organisation vor Elektronik vor Beton, or organization before electronics or concrete. With limited resources — and resources are always limited — transit agencies should exhaust all of the cheapest fixes before heading toward the more expensive “concrete” options like digging new tunnels and laying more track. Working together on maps, fare structure, and ticketing is certainly a great way for agencies to put organization first, and deliver great benefits for the transit riding public.